Why can we get certain of your products only in the UK and not in the USA? Hershey Chocolate USA 19 East Chocolate Avenue, PO Box 819, Hershey, PA 17033-0819, USA Hershey do not, however, include all the British products in their range. Why does the taste of the same product often differ from country to country? The composition of export lines is always as near as possible to that of the UK product. However, we have to comply with the food laws in the country in which the product is being sold. This does affect the end result where food laws differ significantly from the UK. Why does the taste of the same product often differ from brand to brand? The way chocolate is stored can affect the taste. For instance chocolate stored in a warm environment will become stale more quickly than chocolate stored in a refrigerator. Although the recipe and ingredients for our chocolates are always controlled to tight recipe standards, on occasions ingredients are sourced from different areas, and milk particularly can taste differently when bought from different areas of the country. Chocolate recipes and textures are different. For instance a bar of Cadbury Dairy Milk tastes quite different to a Flake or a Wispa because they have different recipes. What is the purpose of the Cadbury website? The Cadbury website provides a variety of information about the world of chocolate and Cadbury's vital role in that everpopular market. It has attracted millions of visitors since its launch in March 1996. Although the Cadbury site is a popular stop for Internet surfers, it was not designed as a promotional tool for its brands but rather as an educational and informative source for interested surfers from educational establishments to chocolate-loving members of the public. 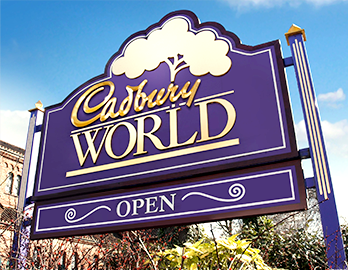 The aims of Cadbury.co.uk are to provide a safe, fun and interesting environment for individuals and families alike. Does Cadbury make low fat or diabetic chocolate bars? We don't specialise currently in the manufacture of low fat bars. You may be interested to learn however that our Fry's Turkish Delight bars are 92% fat free! We also produce a range of treatsize and snack size bars which are smaller than our standard bars. Although we have no immediate plans to launch a low fat bar there is always a possibility that we may do so in the future. Unfortunately we do not manufacture chocolates suitable for Diabetics under the Cadbury label. Trebor Bassett confectionery however, which is an associate company of Cadbury Ltd sells Diabetic chocolate under the Ernest Jackson "Special Recipe" label. There are a variety of flavours and products within the range, and these bars are generally available in larger chemists throughout the country. Chemists are also able to order these bars from their suppliers given a little notice. Where do product names come from? The real reason for "99" Flake being so called has been lost in the mists of time,but this is an extract from an article which appeared in a Cadbury works paper many years ago. At a recent Sales conference Mr Berry, a sales manager, told a story of how Flake became associated with ice cream and how "99" Flake came by its name. "When I first came north in 1928 I found that some of the Italian soft ice cream makers in County Durham were trying ways of introducing other lines to increase their sales, which in those days were largely in the form of sandwich wafers. The possibilities were obvious if we could get a suitable line, both in shape and size and texture - and the most promising was Flake, which at that time only sold as a 2d line, and therefore had to be cut with a knife to reduce its size." It proved very successful and its popularity quickly spread. After successive introductions of half penny and 1d Flake, both of which were sold with ice cream, the Sales Committee finally agreed to produce a special size to fit the sandwich and Mr Berry visited a number of Italian customers in the area. After this of course the cornet with the Flake placed temptingly in the top of the ice cream became very popular. In the days of the monarchy in Italy the King has a specially chosen guard consisting of 99 men, and subsequently anything really special or first class was known as "99" - and that his how "99" Flake came by its name. How should I melt chocolate? Cadbury Dairy Milk chocolate is a rich dessert chocolate and therefore hard to melt. A plain chocolate like Bournville is very much easier and more successful in cooking. Both need to be 'tempered' carefully which is extremely difficult to do at home successfully. Here at Cadbury we have a Research and Development Team who, in partnership with the Marketing Department continually investigate new product ideas. Development of a new chocolate product requires tremendous investment, both in time and financial resources. For every new product that reaches the market place, fifty or more will have failed to meet expectations somewhere during development. New products have to be carefully researched to ensure they have mass appeal, and the decision to introduce a new Cadbury chocolate product is always based on the results of extensive market research. What is the Cadbury Foundation? The Cadbury Foundation dates back to 1935 and was set up in recognition of company founders, George and Richard Cadbury and their investment in the welfare of their employees and wider communities. Today the Foundation’s ethos of “helping others to help themselves” acknowledges our heritage, and the original Cadbury brothers’ conviction that prosperous, educated, enterprising and inclusive communities are good for business. We support charities across the UK and Ireland which are located close to our sites so that colleagues can contribute their time and skills. Our approach is to actively seek projects to support and therefore unfortunately we cannot accept any unsolicited applications.